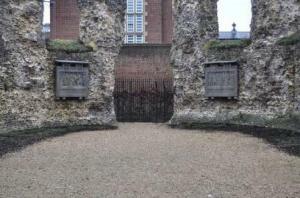 Two important stone memorial plaques in the Abbey Ruins have received extra protection this month to preserve them from adverse effects of the weather. 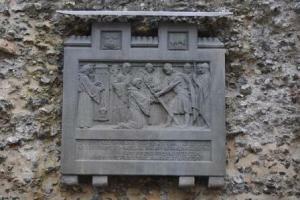 The listed memorial plaques, located in the Abbey’s Chapter House, celebrate the abbey’s first and last abbots, Hugh de Boves and Hugh of Faringdon. The Council’s conservation contractors installed stainless steel weather canopies over the memorial plaques on 15th January, as part of the ongoing work to preserve the abbey for future generations. The work also included improvements to the steel mounts on the carved stones along the Cloister walk. This protection work follows on from the annual winter conservation in November 2018 on low level sections of the dormitory walls, using a medieval technique of hot lime mortar, similar to the methods used in the original construction of abbey almost 900 years ago. This work is due to be repeated in spring when the conservation team will check for loose flint at a higher level. Cllr Sarah Hacker, Reading’s Lead Member for Culture, Heritage and Recreation, said: “In the Abbey Quarter, Reading boasts a site of national significance. Last summer the Council fulfilled its long-standing ambition to preserve these important ruins and open the abbey to the public. The ongoing conservation work is part of our commitment to maintaining the ruins for future generations to appreciate.